High School senior Edgar Gonzalez credits his family for serving as a driving force behind his education. Edgar’s parents left everything they knew in Monterrey and Nuevo Leon, Mexico, in search of greater educational opportunities in the United States. As a result, Edgar has taken his family’s sacrifice to heart, and wants to uphold his parents’ legacy and support his community through education. After participating in CHCI’s R2L NextGen Program, Edgar was inspired to get involved in his community and to serve as a voice for Latino culture on his high school campus. He was elected president of Latinos Unidos at his school, a club that allows him to represent the Latino community. He credits CHCI for sparking this flame. 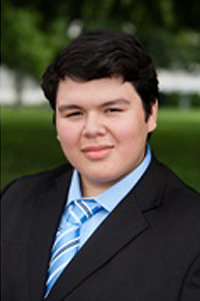 “CHCI provided me with the leadership skills I needed to succeed,” says Edgar. The community’s prosperity is very important to Edgar, and he understands that there is a lack of representation at every level of politics. This is why he actively seeks opportunities to be engaged and serve as a role model for his peers. With the end of his high school career approaching, Edgar is now making important college decisions. He has been accepted to six colleges, including Harvard University. While he has not officially committed to a school, he strongly believes he will be attending Harvard. Another important decision he is considering during this time is his area of study. Currently, he has an interest in political science and aspires to pursue a law degree after college. The CHCI Familia is proud of Edgar’s accomplishment and excited to see what more he will do as he enters the next stage of his academic career in college.